A social entrepreneur and former filmmaker’s account of how adopting two Chinese daughters inspired her to help China reform its child welfare system from within. Bowen and her husband were two empty nesters with respectable but unfulfilling careers in the Hollywood movie industry. 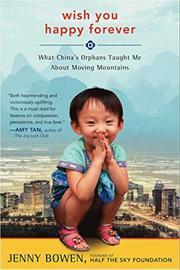 That all changed in early 1996 when they saw a photo of a malnourished Chinese child in the New York Times and learned that China allowed thousands of orphans, most of them female, to die every year. After adopting a little girl and watching the sick, dispirited waif grow into a healthy, happy child, Bowen realized that she also wanted to help her daughter’s “orphaned sisters.” So in 1998, she created a nonprofit organization that advocated a child-centered approach to caring for abandoned or parentless children. She named it Half the Sky in honor of a Chinese saying that “[w]omen hold up half the sky.” At the time, the Chinese government actively discouraged foreigners from setting up aid programs in China. Yet Bowen persevered, often going against a board of directors that disagreed with her decisions and tactics. She faced other major challenges as well, such as fallout from 9/11, the SARS epidemic, earthquakes and other natural disasters. These found embodiment in her second adopted daughter, a wary, physically traumatized child who came to trust her only very gradually. But Half the Sky succeeded beyond her wildest dreams. Bowen was able to establish more than 50 sites around China dedicated to helping all abandoned children, including those with special needs. In 2008, government officials allowed Half the Sky to become just the third registered NGO in China. Two years later, Bowen’s most ambitious vision—to help Chinese child welfare social workers create loving environments for orphans—also became a reality. Memorable and moving, Bowen’s story is a gift straight from the heart. A great complement to Nicholas D. Kristof and Sheryl WuDunn's Half the Sky (2009).